It's a mixture of these different Akashi single malts that compose the Tokinoka which means "fragrance of time" in japanese. It is therefore not an old blended malt but an entry level one bottled at 40% in a little White Oak whiskies typical bottle form of 50 cl. 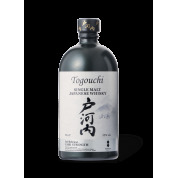 Its delicate fruity aromas make the Tokinoka an ideal whisky to begin with japanese whiskies.